After arriving at 1:00 AM in Istanbul, we managed to get through passport control and through customs to get to the hotel at about 2:30 AM. After getting a full tour of this hotel room. It deserves its own post, just be warned, it has its own doorbell and steam room. After finally getting to sleep, we slept until about noon, then decided to get up and make a plan. We knew it would be too short of a day at that point to get a good handle on the major sites like the Hagia Sophia and the Blue Mosque. So we got some food at a place called Touchdown and then took the walk to Dolmabahce Palace. Then after I take my 3rd picture of the day, I get an error on my camera that it is out of memory. Yesterday, I forgot to put my SD Card back in the camera from the laptop. By this point, honestly we are still a little wiped from yesterday’s travels, the time zones and how hot it was outside so we decide to spend some time with the magazines on Istanbul that are in the room and then decide to head to the Galata Tower to take some pictures and see if we want to do dinner at their restaurant that has a fabulous view of all of Istanbul. We still can’t quite figure out where to catch the trams and how they run, since they are not close to the hotel. And basically all of the maps put some of the things we have looked at so far very close together, then we go to walk and realize that they aren’t close at all. 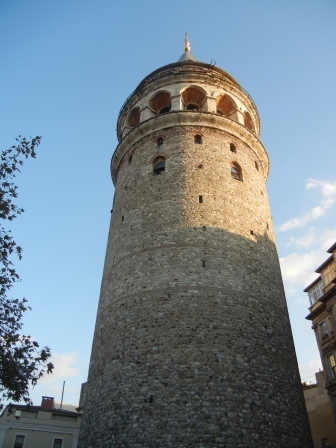 So, we take an extra exciting taxi ride about 5:00 PM (middle of rush hour traffic) to get to Galata Tower. I can’t even explain how going down the hugely steep streets, narrowly missing pedestrians, people on scooters and honking the horn felt. It was like a roller-coaster ride. 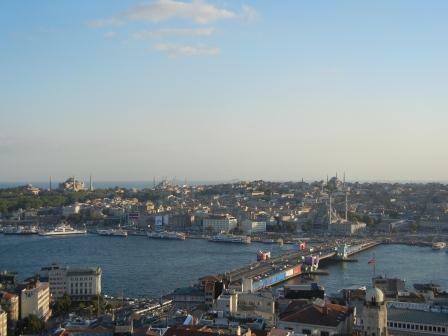 We made it to Galata Tower and went up the steps to the great view. 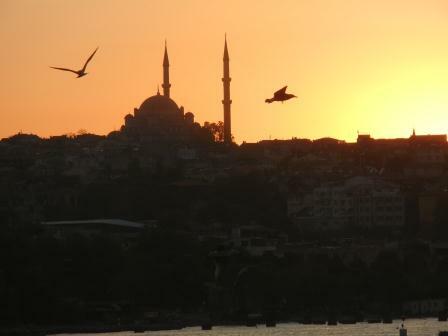 After we came back down and walked around we headed toward the Bosphorus and Golden Horn. Basically we just headed to the water. The street vendors and fisherman were out on the bridge. I can’t decide which “street meat” was scarier: was it the raw mussels that they squeezed lemon on or the popcorn type cart with rice, chickpeas and anchovies? We got to see the sun set which was beautiful and a great way to end the touristy part of the day. After we walked around more, we went to Hamdi to eat dinner. The Hummus and Kebaps were great, then we walked part of the way back to the hotel then grabbed a taxi. Where the driver proceeded to eat, take a phone call, then smoke and drop us off at the Grand Hyatt and not the Park Hyatt. So we took Cab #2 to the Park Hyatt. Tomorrow, for the first time on the trip we have an alarm set and maybe we will try to figure out the tram system in Istanbul. Hope you get some rest! I’m glad you were able to get out and about a little on your first day. Enjoy your time there.